Our play school has an international standard, with equipments which no other playschool can provide, or had provided till now. We have great looking interiors and loving toys for students who are monitored by well trained and expert people in the field of baby sitting. Playschool Education believes in providing each individual child with a stimulating and safe environment, in which they feel empowered, enabling them to learn and develop at an early age. We want your young ones to have as much fun as you. The Deltin Suites' creche is a designated entertainment zone for kids to learn and play. With a range of interactive games at their little fingertips, your tiny tots are sure to have a blast. 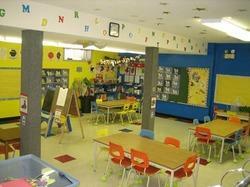 - Increase the ambience of your school One Stop Design Solutions will help you in planning your layout. Indoor Children play Zone for Kids. We provide the Customized Solutions for the Pre-school and the commercial use in the Shopping malls. Area required is from 250 sq feet to 5000 sq feet.